All years, all makes and models, will ship anywhere. I have recently purchased new old stock inventories of several brands. I specialize in Scott - McCulloch - Westbend - Chrysler and pre 1980 OMC products. I am also interested in purchasing Scott & Westbend Outboards in any condition. Recently retired Johnson Dealer of 33 years has N.O.S. and used parts dating back 30 years before I became a dealer. Mechanical and or Cosmetic Restorations. 905-470-7705 at home, call before 9pm EST please. Visit Peter's website: www.nymarine.ca for details. 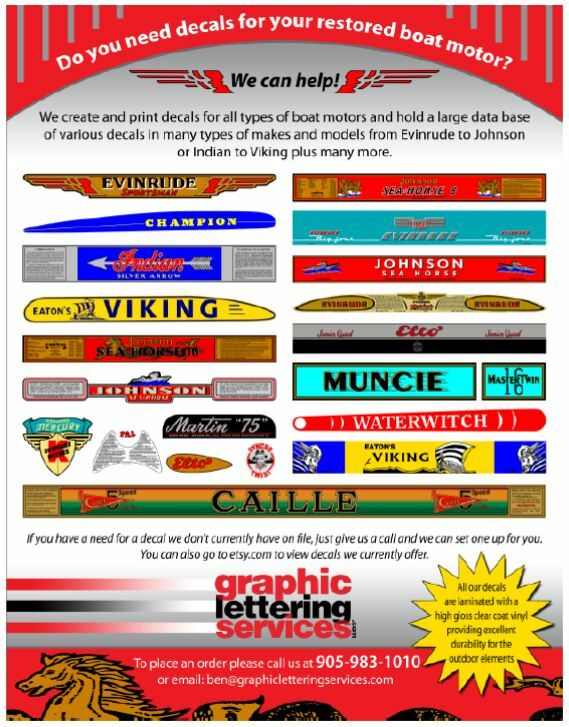 Copies of old Antique and Classic Outboard Motor ads available. ​Made just like the originals. They are made from mould injected polycarbonate. The pigments were matched to the unfaded original colours and the whole piece was then plastic metallized and grey coated to completely seal the back. ​Also for sale are recoil covers for the 1956 and 1957 Javelins and the numbers 3 and 5 for the 1957 javelin. The covers are rough cast in aluminum and require some light final finishing. The numbers are cast in silica bronze and won't corrode and require a light final finish and polishing. They buff to a brilliant like gold finish so there is no need for gold plating.